The last PPC campaign I analysed in the ‘Analyse A Real PPC Campaign’ series was from iCademy, who had a great example of how targeting the wrong keywords can have detrimental affects to the conversion rate and eat away into the budget of a PPC campaign. It seems iCademy did not use negative keywords such as ‘clothing’, causing people wanting to buy school clothing to see their advert about online educational courses. Straight away, it is interesting that LinkedIn have chosen to bid for the brand name ‘Bosch’. People searching for Bosch could be searching for a whole range of things: not just careers. 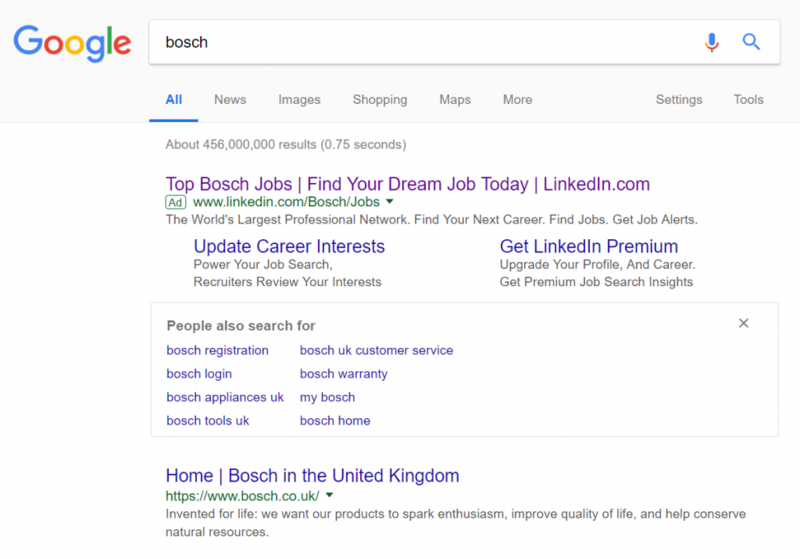 In some sense, the targeting of this PPC search advert is too vague, causing a lot of traffic not interested in careers at Bosch to land onto LinkedIn’s website of Bosch careers available. Even with the vague targeting, it is not a wasted efforts. LinkedIn is the #1 place for jobs and careers, as a social media platform. Therefore, by pushing people to LinkedIn from Bosch is like pushing people to Amazon – they will find something useful on the website since it is so large and has so much content on it. Regardless, putting this general and vague targeting aside, the advert is very good. The call to action (CTA) ‘Find Your Dream Job Today’ is a really good CTA, making the point that CTAs don’t have to be boring, short and simple. CTAs tend to be examples of ‘Buy now’ or ‘Hurry before the offer ends’. Some of the best CTAs are the ones that are actually a little longer, such as LinkedIn’s one. After clicking on the above advert, I came to the following landing page: This is not a designated landing page for this campaign by LinkedIn. Their social media site is designed well enough that it has the objective of gaining clicks and conversions, be it to apply for jobs or activate the Premium version of their website. Presuming the traffic reaching this page was searching for jobs at Bosch, then this is a great page. 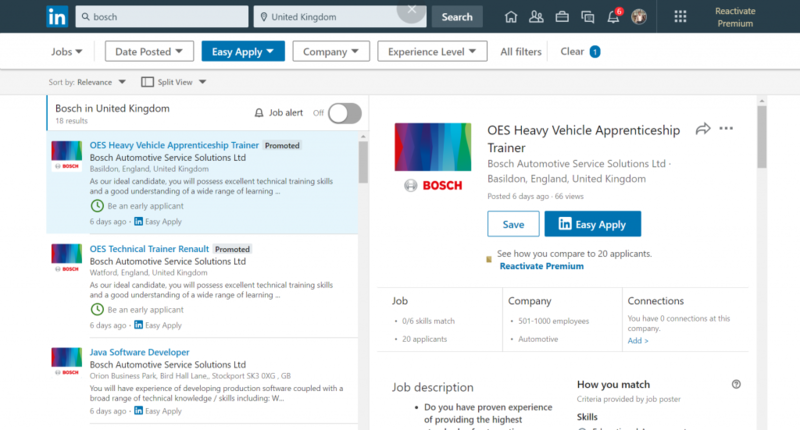 The fact LinkedIn have made it very easy to apply for multiple Bosch jobs, using the ‘Easy Apply’ button, solidifies LinkedIn as a social platform to go to for careers – this is the exact brand image LinkedIn wants. However, as mentioned above already, I feel the targeting might be too broad for this PPC campaign. It would have been better if LinkedIn chose to target more specific keywords, such as ‘Bosch jobs’ etc. instead of just the brand name. Saying this, results will make clear to LinkedIn how effective ‘Bosch’ is as a targeted keyword for this campaign – the fact they are using it suggests potentially that it is working for them, even though the traffic is not completely targeted.